I’ve been working late as well, as you might imagine from the scarcity of posts around these parts, so there was no news roundup on Sunday (not that much happened, and what did happen I’ll get to this weekend). However, I’ve been enjoying reading all your entries in the word balloon contest and will have a poll up tomorrow evening. If you haven’t entered your suggestions yet, do it right now! While on the long train ride home Sunday evening, I had to resort to providing my own entertainment and had a little fun on Twitter, thinking up jobs Matt might be less than stellar at. Below is the list I came up with. Feel free to chime in. No prize this time, though. "What do you mean the code is broken? The page looks fine to me!" – Matt Murdock, less than stelar web-designer. "Hum, I have to go to the bathroom, really! So sorry, my partner will fill you in with the details: he just loves to work late"
"Huh, please… please, bear with my partner. We've had some… indian food earlier. We've all been there before, I'm sure he'll be back shortly." 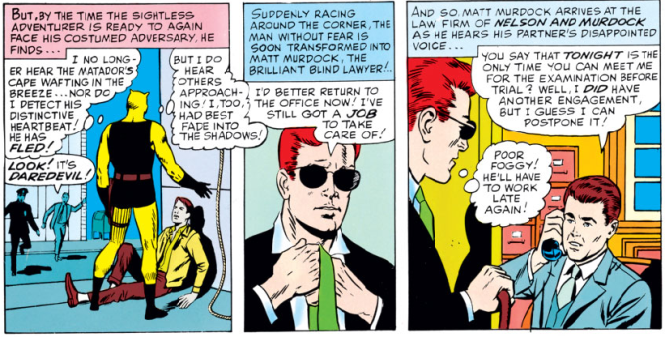 Foggy Nelson, ally of a costumed vigilante. On the verge of a nervous crisis.